Electron microscopes from our FEI business, X-ray diffractometers and Raman imaging microscopes provide insight into the structure of materials with microscopic and crystallographic capabilities. X-ray fluorescence spectrometers, FTIR spectrometers and X-ray photoelectron spectrometers enable researchers and material analysts to probe the chemical composition of materials ranging from ultra thin-films to bulk powders used in product development and materials troubleshooting. We offer a line of rheometry and viscometry instruments, as well as single- and twin-screw extruders, for laboratory benches that enable you to measure the physical property of semi-solids and liquids for shear flow and yield stress. No other company offers the breadth of products and the depth of analytical capabilities for materials science and engineering. Our line of Nicolet FTIR spectrometers have led the analytical instrument industry for over fifty years with reliable, robust and flexible solutions. 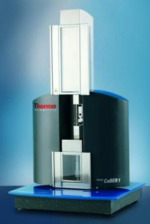 Thermo Scientific Raman spectrometers enable point analysis, confocal microscopy and chemical imaging. Everyday, Thermo Fisher customers from around the globe seek solutions to complex challenges about product quality, manufacturing efficiency and material properties with electron microscopy, ion beam and SEM/EDS, WDS and EBSD capabilities that enable the next breakthrough discovery. Rapidly characterize materials for qualitative and quantitative chemistry specifications with the gold-standard for accurate, nondestructive elemental analysis across a wide range of materials. Our line of ARL EQUINOX X-ray diffractometers provides high-performance results in a wide range of industrial and research applications including academic research, chemicals, pharmaceuticals, polymers, semiconductors, thin films, metals and minerals. Thermo Scientific rheometers and viscometers are designed to accurately measure the properties of fluids and other complex materials. They are recognized for accuracy and ease of use in quality control, product development, and research applications. Our viscometers allow you to quickly determine the flow behavior of fluids and are designed for your application. Ideal for materials compounding experiments and pilot scale extrusion production, our minicompounders and 11mm parallel twin-screw extruders, and torque rheometers are well-suited for research and development in the polymer, pharmaceutical, bioscience, and nanotechnology sectors.